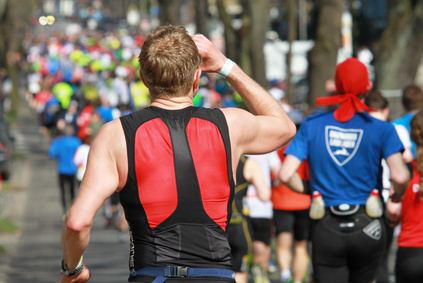 Running a marathon is a great test of endurance, and it’s a challenge many people aspire to. If you’re tempted to sign up for a marathon this year, you’ll need to plan well in advance and start your training regime before you even put your name down. Marathons taken place all over the world throughout the year, so don’t be disheartened if you don’t get a place in the run of your choice: you can always put all that effort to good use elsewhere by applying for another marathon that appeals to you. It’s all about your shoes. Just as you wouldn’t attempt to sail the Atlantic without a top-notch boat, you shouldn’t even consider entering a marathon with shoes that are less than ideal. Visit Foot Solutions for professional advice and measuring, and take a free gait analysis test to ensure you’re wearing the best shoes for your feet. Start early. It’s never too soon to start your training regime for a marathon, and a great idea is to start by doing a half marathon. This can help you to learn how best to pace yourself and how to keep yourself motivated in the toughest moments. Drink plenty. It’s vital to replenish the fluids your body needs during a long run, so experiment beforehand with how much and how often you need to drink, and try water compared with energy drinks to see what works best for you. Prepare for success. Don’t neglect the psychological side of your training plan. It’s important to see yourself achieving your targets and use positive mental imagery to help you throughout the run. Practice on similar terrain. Check out the type of ground you’ll be running on and the gradients involved in your route, and try to practice running on similar ground regularly. Mapping the course and becoming familiar with each element will really help you to prepare for the big day. Eat right. You should always eat a healthy, balanced diet for optimum health and fitness, but if you’re running a marathon, you’ll need a little extra. In the three days prior to your event, focus on eating a higher percentage of carbohydrates, like pasta, bread, potatoes and fruit. You should be sure to eat a carbohydrate-rich breakfast two to three hours before your event begins. Whether you’re preparing for a marathon or starting to run for the first time, you’ll need great shoes to protect and cushion your feet. At Foot Solutions, we have a great range of training shoes to suit you and your lifestyle, and we can help you to find the best options for you.